This animal has a relatively small habitat range, mainly in Cameroon and Equatorial Guinea. Its numbers are dwindling due to habitat destruction and its collection for consumption and the pet trade. Kit, you took action on May 07, 2014. Thanks Cal, signed and shared. Thank you, Cal. I signed! Signed and shared. Thanks, Cal. Signed. Thanks for the forward Cal. Signed #459. Noted. Thanks, Cal. Save the Goliath Frog, also noted with thanks Cher. Noted and signed, # 727. Thanks, Cal. Noted & signed #822! Thanks Cal! 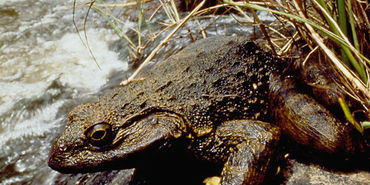 Save the Goliath Frog - I love frogs! Happy to be signer #1525!